Our Products >> Cooltech Refrigerated Open Display Merchandiser 36"
Cooltech Refrigerated Open Display Merchandiser 36"
Full length 14"W laminated stainless steel counter top that provides extra merchandising and work area. One stainless steel shelves on the interior. Dual airflow evaporator technology to ensure energy efficiency and to eliminate the need for a drainage connection. Front air intake and rear discharge. Force air duct flow. 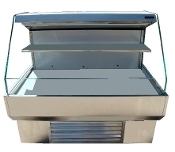 Designed to operate in environment where temperature and humidity do not exceed 75°F and 55% respectively. One-year manufacturer's warranty on parts and compressor.